The feelings that arise for survivors of suicide are complicated and uncomfortable, so if that’s the case for you, you’re not alone. You may be feeling responsibility, regret, anger, sorrow, guilt, or shame. You may be asking yourself “why?” over and over again, searching for answers. These feelings may come and go over the coming days and weeks, but the truth is, the answers are messy. You’ll find some understanding, and you’ll probably find more confusion and heartache as well. But you’re not alone, and you’ll find your way. Let’s talk about responsibility. I once lost a student to suicide, and another teacher in the department told me that she was taking full responsibility for the student’s actions, because, she said, “it takes a village to let someone kill themselves.” My heart broke. What a terrible burden to carry based on something that is wholly untrue! And I want to be crystal clear to every single person who loses someone to suicide, it is absolutely not your fault. Absolutely not. The depth of suffering experienced by someone who suicides is so complex and so intense, you would have to be some sort of omniscient superpower to predict it. Even clues that in retrospect seem obvious are actually not obvious, and could have meant a million other things. You simply couldn’t have known. Let’s talk about regret. Many of you are probably playing recent events and encounters over and over in your mind, searching for clues you might have picked up on, or wishing you had done something different. You may be thinking “well, I know it’s not my fault, but I should have _____, then maybe it wouldn’t have happened.” That’s a sneaky way to disguise regret as responsibility. Again, I want to very firmly, in my big-girl voice, say absolutely not. Regrets are heavy, but they are not the same thing as responsibility. It is okay to wish you had done something different, and if you are having those feelings, I strongly encourage you to find someone to talk to about it, either a friend or a professional. Those regrets are normal, and are not unlike the regrets you might have after any other type of unexpected loss. If you’re having those feelings, it’s okay, but be careful that they don’t start slipping into the realm of responsibility. Let’s talk about anger. If you are angry, it’s okay. The anger will probably mix in unexpected ways with your other feelings. You may feel deeply compassionate and sorrowful, and also angry. These are not paradoxical feelings – they can both be true at the same time. I have worked with survivors who are terrified to admit they are angry because they feel like it’s betraying the person they lost, and devaluing the suffering they were experiencing when they took their own life. It’s sometimes hard to accept, but you have a right to be angry, and it makes sense. A decision was made that affects you, and it’s a painful and irreversible decision. If you’re feeling angry, work on accepting it. Anger doesn’t diminish love. Let’s talk about self care. Emotional exhaustion takes a heavy toll on your body. It is critical that you care for yourself physically and mentally. Be sure you are getting your rest, and if you’re having trouble sleeping, consider taking benadryl or another sleep aid. I am not a proponent of long-term self medication, but in the short-term, getting rest is absolutely critical – an exhausted body makes everything feel worse. Nourish yourself with healthy food and drink lots of water. Comfort yourself with the foods and drinks that feel good to you. If you want to sit in the closet and eat a gallon of ice cream, do it. If you want to rage and cry, do it. Whatever feels good to you, find a safe way to let it out. Keeping those feelings bottled up only makes a bigger mess later. Let’s talk about support. This is a critical part of healing after a loss. There are a lot of people impacted by this situation, and it can be nice to have your own feelings mirrored by others, or to share tears and memories with someone. These interactions of support are very much part of the healing process. Finding others who had the same experience can be helpful, and sometimes it’s helpful to talk to someone who isn’t impacted by the loss, so that you can focus solely on your own experience. If you’re still having strong feelings in a couple of weeks, or if your feelings are so overwhelming that you can’t function at home or at work, consider talking to a counselor or therapist. Mental health professionals have been trained to work with suicide survivors, and can provide support in a way that others may not be able to. Let’s talk about grief. I want to emphasize what I see as the most critical and misunderstood part of grief, and that is the idea that it will someday pass. 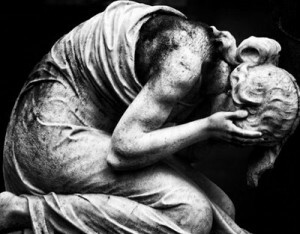 Intense grief is not something that ever completely goes away. It is not uncommon for a client to come to my office and tell me they want therapy to get over their grief. It’s hard for them to hear that they will likely never “get over” it. They may get used to it, and the intensity of it will likely decline significantly, but the loss of someone close to you is not something that goes away. Grief is to be integrated into your life, not erased from it. There are a number of things that impact suicide, far more than I can get into here, so I’ll just touch on a few. Recent research has started looking at how insomnia and suicide are linked. Although the body of research isn’t enough to say anything definitively, it does strongly suggest that those who struggle with depression are much more likely to suicide if they are also struggling with sleep disturbance. It’s unclear why that happens, and hopefully continued research will help clarify that so we can treat depression more effectively. Depression is a scary beast. Very often, people who are struggling with depression feel ashamed of it for many different reasons: sometimes because they feel like it’s a personal failure, or they feel like others are suffering more, they should be more grateful for what they have, or even that they shouldn’t be depressed because their life is good and things are going well. Depression is not always linked to situational factors, although they definitely impact it. It is entirely possible for someone to have everything going “right” in their life, and still be suffering from depression. It’s not easy to talk about those things, because the messages we get from people around us are that we should “think positive!” or “focus on the good stuff!” These responses to depression are part of why negative stigma is perpetuated; it implies that experiencing depression is a choice. Hyperbole and a Half published an incredible illustrated explanation of what it feels like to suffer from depression (Part I Part II). Even when things seem to be fine, depression can ruin everything. The neurochemistry of depression and other mood disorders is complicated, and it wreaks havoc on consciousness. Mix that with medications, substances, and other emotional experiences (even good ones), and you’ve got an unpredictable mix. When a person chooses to suicide, they are very rarely thinking clearly. In fact, the entire response to a suicide threat – involuntary intake at a crisis center – is based on the idea that the person in question does not have the capacity to care for themselves adequately. Simply put, they are not able to make decisions for themselves. One of the things I hate most is when people call the person who suicides “selfish” or “ungrateful.” Rather than labeling them with these terms, let’s think more closely about it. The person who suicides is suffering so much, so intensely, that they desperately need an immediate end to it. When you shut your hand in the car door, do you politely ask the person with you to unlock it so you can remove your hand? No, you shriek and cry and frantically try to find a way out. What if it was your whole body? Depression and suicidal ideation are emotionally and physically painful. We cannot blame someone for seeking a way out of their suffering. None of us want to suffer. We cannot blame or judge someone for having such intense feelings in a time when we think they should have been feeling happy. We may not agree with how they ended their suffering, but we cannot judge them for seeking peace. We can, however, know absolutely that they were hurting. Now we are left holding the pieces, and that isn’t fair. We can be angry about that. We can have regrets, we can have sorrow and grief. We can have confusion and frustration, and all of these things can happen in the context of compassion and love. The process of grief is complicated, and it’s different for every single person. Understanding how different people process can help you give and receive support. I really like the book Tear Soup as a way to explain what’s happening during the grief process, and I have bought and given away more copies than I can count. It’s simple and short and exceptionally powerful. Take care of each other, support each other, and ask for help when you need it.